The Apple article If you see duplicate contacts after setting up iCloud Contacts, suggest using the Card > Look for Duplicates option. However I can clearly see three or four contacts all with the same exact details in the list (e.g. for each contact, there are 3 or 4 duplicates of it), but the "Look for Duplicates" option simply can not. Is there a way to select, by hand if I have to, the contacts and moosh them together into just one contact? Select the cards you wish to merge. Then in the Card menu, select "Merge Selected Cards." If not all of the contacts you want to merge are in the same system (i.e. On My Mac vs. iCloud) you won't be able to merge them, only link them. This will have the same outcome locally: making them appear as a single entry. Any other devices which sync with the same services will need to be linked as well. 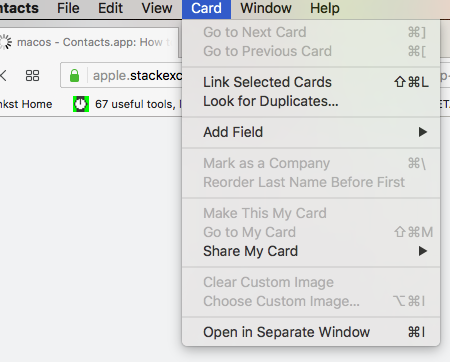 Select any duplicate contacts and use Card > Link Selected Cards (⇧⌘L). If at least two of the cards are in the same system, it appears as Merge and Link Selected Cards, and if they are all in the same system, it appears as Merge Selected Cards. If you want all of your contacts to have all of their information held in a single service, you will need to export the contacts you want to move, delete them from Contacts, and then import them to the service you want them in. Not the answer you're looking for? Browse other questions tagged macos contacts merge . Is it possible to assign a ringtone to a group of contacts? How to merge contacts with same name?